The Floris Arlequin Grand-Place hotel is located in one of the quiet allies streaming out of the famous Grand-Place, in the heart of Brussels' Historical center, the Ilôt Sacré. With its perfect location and comfortable, relaxing rooms, the hotel is the perfect place to enjoy both culture and leisure activities, either when you're on a business trip, or when you're simply vacationing. Large Rooms with a large double bed,duvets and 4 spoiling pillows,sitting corner including a comfortable sofa. coffee table and armchair,minibar, flat screen cable TV and Pay TV System. writting desk, safe box in the cupboard and coffee making facilities.spacious bathroom with bath and shower hairdryer and spoiling ameneties. A double bed or twin bedded room with spoiling duvets and pillows,flat screen cable TV and home cinema movies system, a writting desk, bathrooms with shower and bath. Floris Arlequin Grand'Place Hotel breakfast restaurant, 7th Heaven, is located on the 7th floor of the hotel with an overwhelming bird's eye view of the Grand Place and the magnificent sights of the churches, museums and beautiful monuments spread out all over the city of Brussels. Here, you can start your day with a unique, enjoyable experience – a hot, tasty cup of coffee and a rich continental breakfast buffet on the top of the world. 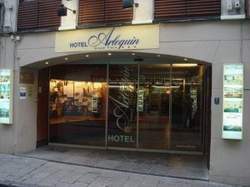 The Arlequin business lounge located on the 7'Th floor over viewing beautiful monuments of the city. A sitting corner for meeting, flat screen pc with wireless connection, soft drinks and fruit. Gathering facilities for any purpose, including business meetings, family events, parties and the likes. suitable for 80 pax sitting in theatre style and 50 pax sitting around tables. all audio visual equippment is avialble upon request. A fully equipped fitness room, open throughout the day, free of charge.